Hello, Katie from Abella’s Braids here! It’s finally June! School is out and wedding season is in full swing! 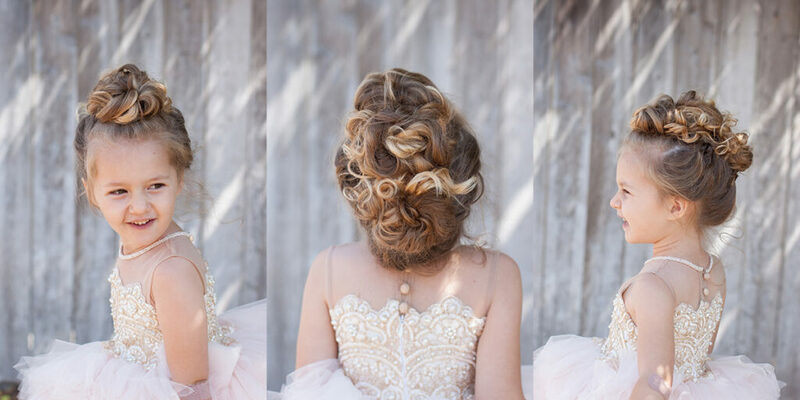 So we thought, what better to do for our monthly post than bridal styles! 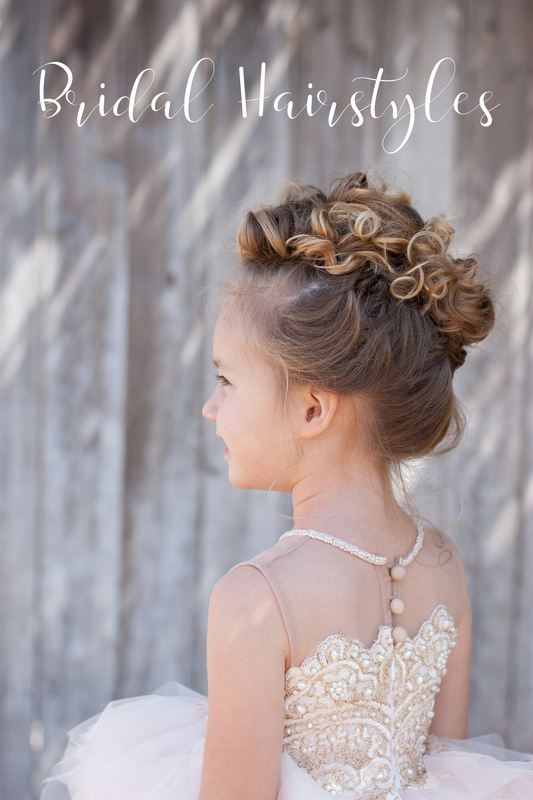 All of these styles are done on my daughter Charlie, so they are shown more as a flower girl style, but they are elegant enough for anyone in the bridal party, including the bride! We hope you love them! We sure had fun creating them! All of the styles in this post were created after doing our retro waves all over the head (you can find the tutorial here on Cute Girl’s Hairstyles at: How to Make Perfect Retro Waves They are done using a 1/2″ curling iron, wrapping the hair around the barrel in 1/2″ sections. For this style, after you’re done curling, you’re basically going to section the hair into three ponytails. The first one is nice and high on the head, using a round section. Ten there are two below it. Make a bun with each ponytail and tug on them until you get them perfect! Done! The most difficult part of this style is actually curling it because it takes a while to curl an entire head with a 1/2″ curling iron! It’s well worth it, though, because your curls will stay in so well. 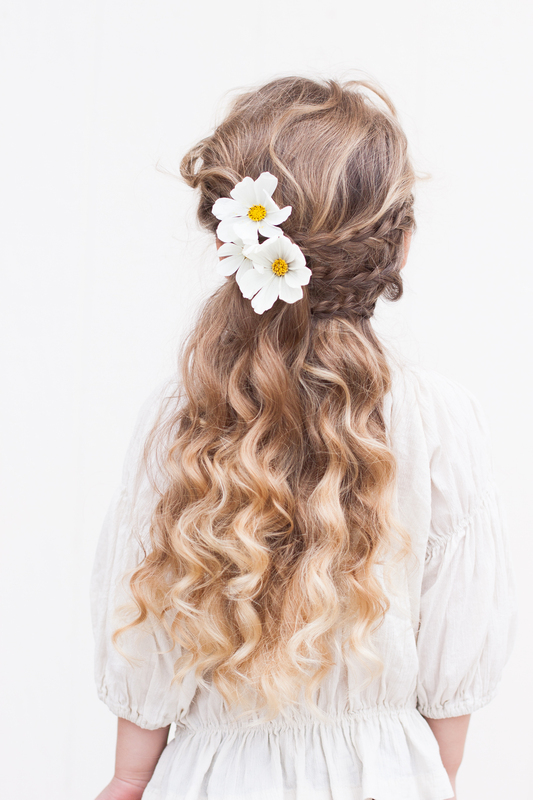 Because of being such tight waves, there’s plenty of room for them to relax but stay curly! I’m in love with the simple elegance of this style! This style is done with the same retro waves (link above). I started by making a part on one side of the head, then I started a dutch lace braid. I brought it across the front of the face and around the head. The trick is to only add hair into the braid as you cross the outside section over. Make sure to braid the hair all the way to the nape of the neck. The rest of the hair is loosely gathered to one side and pinned. I made sure to leave lots of hair around the face on the side where there is no braid. 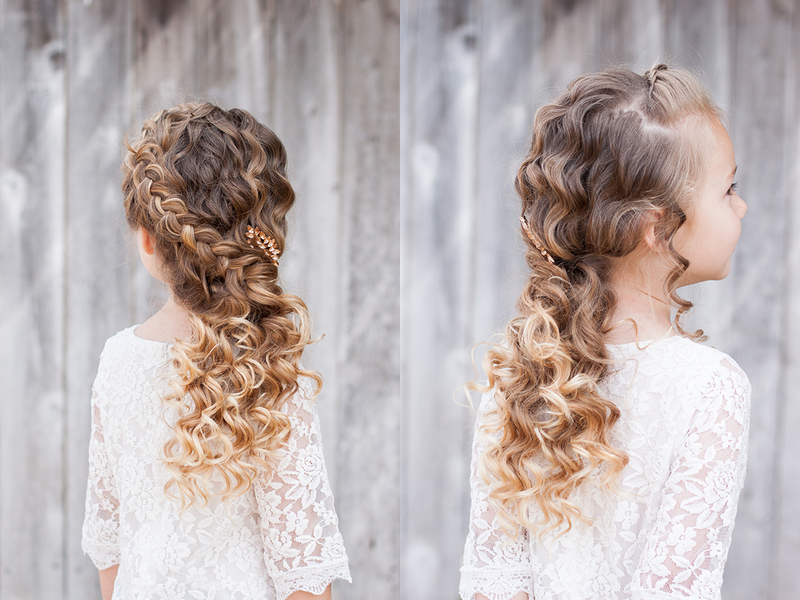 This braid also incorporates a lace braid. I made a part from ear to ear (where a headband would sit) and did a lace braid across Charlie’s forehead. If you hold the braid down toward the eyebrows as you work, it will create a braided bang effect. I finished braiding all the way to the ends, then I brought the end piece up and over the part line to hide it. A little tip I recently learned: use eyelash glue instead of pins when you are working with a small amount of hair to hold it in place instead of pins! So smart! I finished off the style with a diagonal french braid into a side ponytail. I used pins instead of an elastic to keep the look soft, and the same retro waves for texture (start with the waves before braiding). 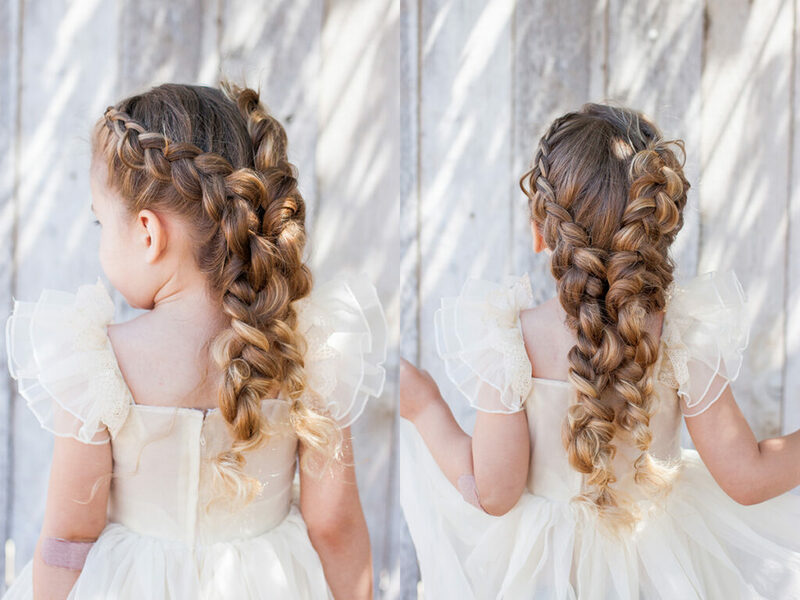 This style is basically dutch pancaked pigtail braids. Instead of actually parting the hair and taking slices all the way down to the scalp as I braided, I lightly added sections. The right hand side is done more to the middle. This just shows that nothing has to be perfect! By being a little less concerned with perfection, you can create a more carefree, romantic look. With being done after doing such tight waves, the pigtail braids themselves wanted to curl up a little, which was really cool! Our last style is super simple. Before I explain it, I wanted to show you how amazing those waves hold up. 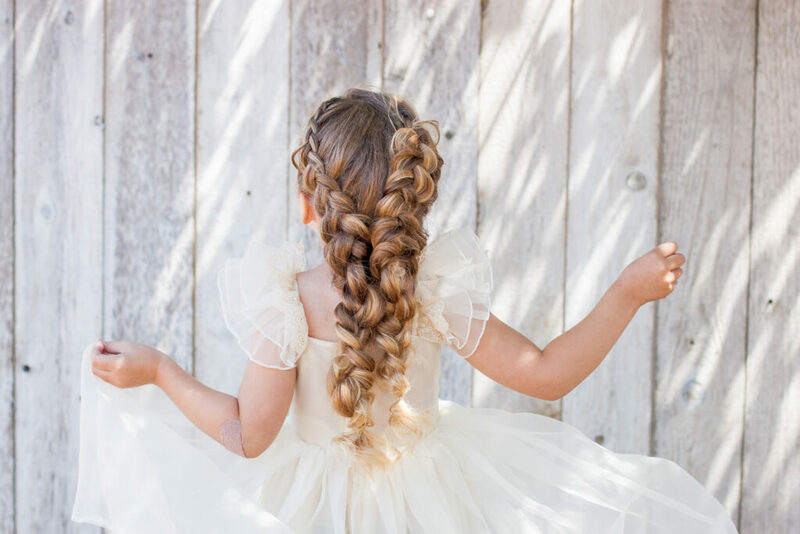 This was literally the last hairstyle we did, and after the four other braids and a couple of failed styles and many brushings, the curls still held this strong! I love it! 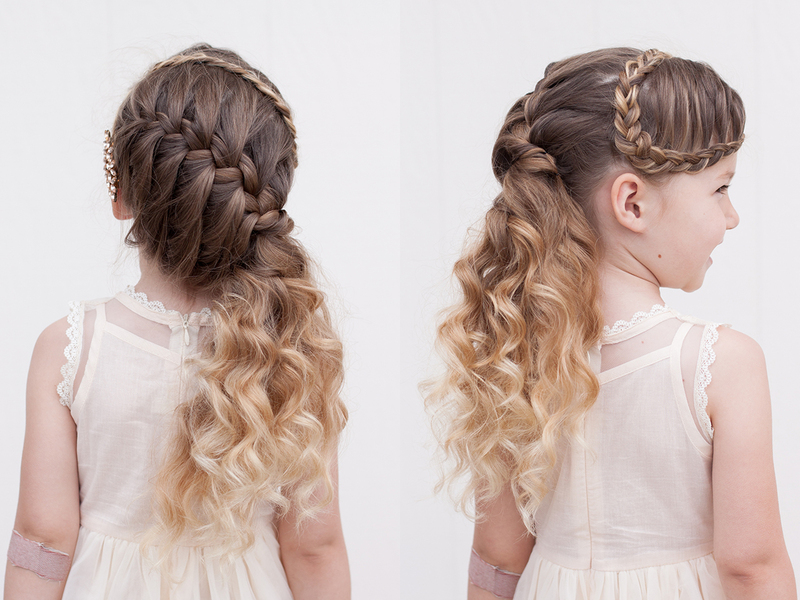 So to do this style, Just take small pieces from the front of the hair and braid them (I chose to do three braids). Bring the braids over to the other side. With the hair on the other side, you want to roll the hair toward the braids to cover the ends and pin it down. I added some fresh flowers for a beautiful accent! I wouldn’t suggest this type of flower for a wedding because they wilted within the hour really bad, but they sure were pretty for the photo! Thanks for checking out our blog! Be sure to check out our personal blog Abella’s Braids! I’m currently making LOTS of changes to it and I’m really excited about it! Happy braiding, and if you’re getting married this month, CONGRATULATIONS!